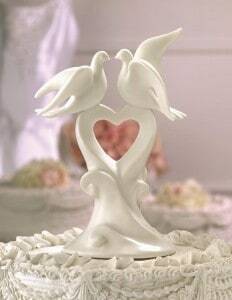 Wedding doves – displays and releases – are breathtaking! Two wedding doves are released by the Bride and Groom (with our help and under our direct supervision) in an outside setting of your choice. We provide white gloves for the ceremonial wedding dove release. You’ll also find us dressed for you occasion. Our Doves may be released directly upon exiting the wedding ceremony or when your wedding photos are taken. 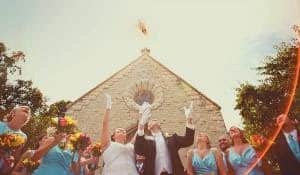 The photo shows wedding doves released at a friends wedding. If you like, we can display the wedding doves from before the start of the ceremony, so guests may view the pair in a beautiful, ornate cage upon arrival for your wedding ceremony. We also offer a Wedding Party Dove Release in which all of the members of your wedding party release wedding doves. All of your wedding party members will be thrilled with participating and have a life-long memory – and guests will enjoy the large group release. We bring white gloves if the wedding party wishes to use them. This release may occur any time after the wedding ceremony (or during the ceremony for outdoor weddings) or when your wedding photos are taken. We will work with you to adapt the display and/or release special. The safety and health of our Birds of Peace is the only limiting factor. Releases must be scheduled with at least two hours of daylight left, and we reserve the right not to release in severe weather. We look forward to helping you ensure your special day engenders wonderful memories for a lifetime. We will work with the photographer at your wedding! We welcome the opportunity to work with wedding planners and wedding photographers, as well as directly with the wedding party! 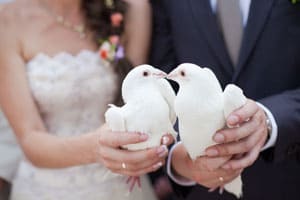 See http://www.pinterest.com/jevelwedding/doves-release-jevel-wedding-planning/ for great images. Wedding Celebration Service Area < Click to see a map of our service area for Dove Releases!